We all know that cherries are absolutely delicious and they are pretty healthy, too. So can we share some cherries with our bearded dragons? Can bearded dragons eat cherries or can cherries be dangerous for them? While bearded dragons can eat cherries once in a while, they are not healthy for them. Cherries contain, like all fruits, a lot of sugar and are very high in fruit acid, which can lead to an irritation of a bearded dragon´s digestive system. That was the short answer. However, you might have more question about cherries. How often can you feed them to your bearded dragon? Why are they bad in detail? Which fruit would be better to feed? Continue to read to learn more! Can Bearded Dragons Eat Cherries? You just learned that cherries can be pretty bad for a bearded dragon, but what does that mean in detail? What will happen if a bearded dragon´s digestive system is irritated? Are all fruits bad for bearded dragons? There are a couple of fruits bearded dragons can eat pretty often, I´d say almost every day, even though I stopped feeding fruits to my bearded dragons entirely. Why did I do that? 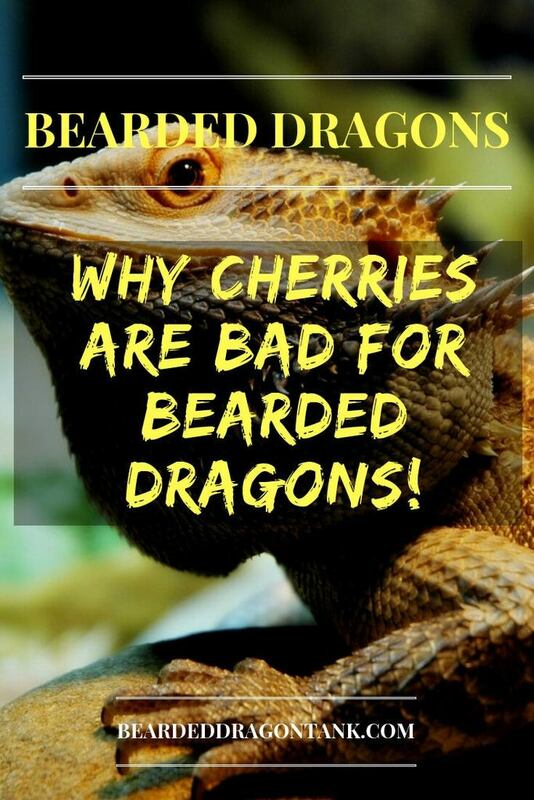 Well, let´s take cherries as an example to explain to you why most fruits are pretty bad for your bearded dragon. Every person who ate a cherry at least once knows that they can be pretty sour. This shows that this fruit is very high in fruit acid. While most fruits that are sour are pretty healthy for humans, because they are very high in vitamin c, they are not that healthy for bearded dragons. The fruit acid combined with the sugar is very bad for their digestive system. Bearded dragons can get diarrhea from eating too many cherries and from eating too much of other fruits as well. You have to understand that cherries and most other fruits do not belong to a bearded dragon´s natural diet plan in the wild of Australia. Fruits like cherries simply do not grow in the dry woodlands where beardies live and that is why their digestive system is not made for dealing with fruits. If a bearded dragon eats too many cherries and is suffering from diarrhea for a long period of time, it can become dehydrated. Further, a bearded dragon that is dehydrated and suffering from diarrhea is more vulnerable to other diseases and parasites. When I was a beginner when it comes to bearded dragons, I fed my bearded dragons too many oranges. The result was that my bearded dragon suffered from diarrhea, dehydration and it was suffering from parasites called oxyures. A relatively low number of oxyures live in every bearded dragon, that´s just normal and not dangerous at all. However, if a bearded dragon is weakened and has diarrhea, the number of oxyures in its digestive system can rise rapidly. If you want to read the full story, I recommend that your read my article on bearded dragons and oranges. Click here to read it. While the calcium:phosphor ratio in cherries is not that bad, it still isn´t optimal for a bearded dragon, but let me explain first why this is important. As you probably know, bearded dragons need a lot of calcium. If a bearded dragon will not get enough calcium, it will get sick, there is no way around it. Bearded dragons need calcium for healthy bones and calcium deficiency over a long period of time will lead to metabolic bone disease. Metabolic bone disease is an absolutely terrible disease. Your bearded dragon´s bones will become soft and its body will become deformed. Eventually, your bearded dragon won´t be able to walk or hunt anymore. More on that here. So as you see, they need a sufficient amount of calcium, but they also need phosphor, otherwise they are not able to process the calcium. However, the perfect ratio is 2:1 (calcium:phosphor) and cherries do not have that. While you can deal with this problem by using calcium powder, it shows that cherries are not a natural thing to eat for bearded dragons. In the wild, bearded dragons do not need any calcium supplements as they get all the calcium they need from their food and by eating dirt. We only have to supplement the feeder insects, because the mass-produced feeder insects do not contain so many vitamins and minerals as wild insects do. Talking about calcium, cherries also contain oxalic acid. Bearded dragons should not eat too many foods that contain oxalic acids, because those acids can bind the calcium a bearded dragon took in and make it unusable, which means that your bearded dragon will excrete the calcium with its feces, but not process it to its bones. 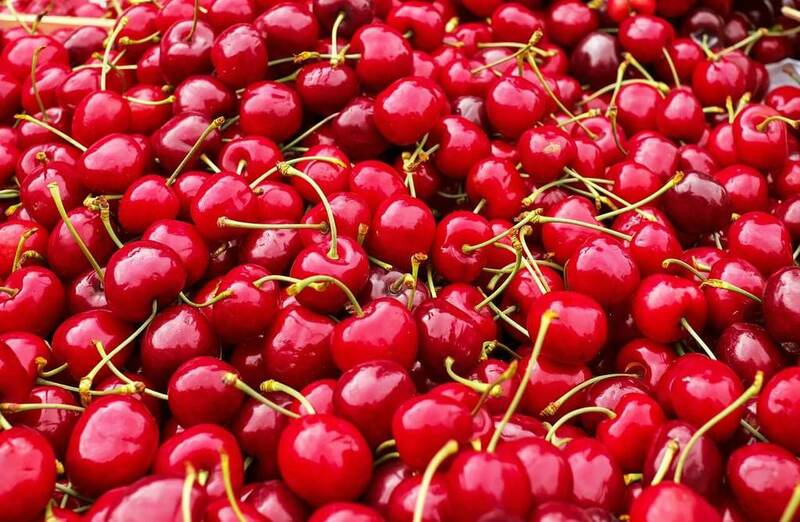 While cherries are very low in oxalic acid, feeding too many of them too often, can cause problems. What Might Be A Better Fruit To Feed? Unfortunately, there are not a lot of fruits you can feed your bearded dragons unhesitatingly. Don´t get me wrong, your bearded dragon won´t die if you give it a cherry once a month, but there are only a few fruits that can be fed on a daily base or on a weekly base. I recommend to feed cactus pear and I am pretty sure that you have not heard that before. However, bearded dragons love cactus pear and they are actually pretty healthy for beardies. They are low in fat and protein, so that your bearded dragon doesn´t get fat, they have the perfect calcium:phosphor ratio and are not too watery which could lead to diarrhea. So if you want to feed your beardie fruits, cactus pea is the fruit you should get. A lot of people feed them on a daily base, but I´d recommend to test things out first. See if your bearded dragon likes it and if it might have any problems to digest these fruits first, before you feed them very often. Regarding cherries, there a couple of questions left that people ask me very often. Here are those questions and the answers to them. Can Bearded Dragons Eat Sweet Cherries? Whether it be sweet cherries or normal cherries, bearded dragon should not eat cherries too often. Cherries are high in fruit acid which can irritate a bearded dragons digestive system and lead to diarrhea and other digestive problems. Can Bearded Dragons Eat Dried Cherries? Bearded dragons and other reptiles should not eat any processed fruits like dried cherries for example. Processed fruits almost always contain sweeteners and other additives which can be poisonous for bearded dragons. I know that you probably love to feed your bearded dragon fruits. I understand that it feels good to share some “human” foods with bearded dragons, but unfortunately bearded dragons are not made to eat most fruits. While you can feed cherries from time to time, it just doesn´t make sense and I highly recommend to not feed them at all. Instead try to feed cactus pea to your bearded dragon and let me know if your beardie likes it by leaving a comment below this article. So can bearded dragons eat cherries? They shouldn´t! Previous Previous post: Why Sand Is Not Bad For Your Bearded Dragon!